There are folk tales of a forest that is always overflowing with life, no matter how many foragers and hunters stalk into its depths... Well, you found it. Oh, and it turns out that it eats people to stay alive. The more you know. Now you're stuck here, and your fellow travellers are looking less than pleased with you. Might as well build that town you were planning! Put the man-eating forest somewhere near the top of the to-do list, though. A pretty simple city-builder (I guess?! ), but with a twist! You win if you can get to a population of 100+ and then last 3 (possibly 4...?) nights without anyone dying. You lose if everyone dies. I really could have done a better job of getting the mechanics across, so if you're stuck definitely check out the hints below. - The forest is the thing that allows your village to grow, but under the cover of darkness it's actually out to kill everyone. - You're building the foundations of a new village/town on the idea of sacrificing the poorest members of your society. I was inspired by the theme, but I didn't see the need to rigidly stick with it, so those justifications are a bit ropey. - There's a tooltip at the bottom left of the screen if you hover over buildings and over the buttons for the buildings in the top right. - At the end of the day, the Hunger value (dependent on how many villagers you have) will be subtracted from your food stores and if there's more Hunger than Food, some of your villagers will die. - Buildings are destroyed when all of their occupants die - either because of monsters or starvation. - The monsters attack the houses nearest to the center of the forest, but they have to have been around long enough before night to have spawned villagers (hover over to see how many occupants a house has). - The villa generates gold once a day, at the very start of the next day. It also depends on how many people are living in the villas. DAY 1 - Build 2 houses and a forester straight away. The houses very close to the forest, and the forester far away. As soon as you have resources for it, build more houses next to the first two. You should have about 5 before you stop building them and let your food build up. When the monsters come in the night they'll take 8 villagers, so you'll be left with 3 houses. DAY 2 - Keep building houses, build another forester. Again, stop building at about sunset and let the food build up so your villagers don't starve and die. DAY 3 - Enough houses to make up for the ones you lost, plus a couple. Then build as many villas (far away from the forest) as you can, stopping at sunset. DAY 4+ - From this point on, build resource buildings as you need them. Build guard towers in between the forest and your houses. Try to build houses away from the forest now, but not so far that it takes them ages to get there. After a few more days you should have enough towers that the monsters die before killing villagers, and then after a few more days you should win! NOTE: There's a bug that I've not been able to reproduce where some of the timings go out of sync. I'll look into it, but I'm having a hard time getting it to happen! I love it, it is quite relaxing. @Slader - Probably not anytime soon ): I'm super busy with other games right now. Maybe sometime in the future, though! @Kulomin - Thanks for the feedback! There's a tooltip in the bottom right of the screen that tells you things about stuff you hover over. I'm not super happy with the UI in general, and I can see why it'd not be obvious! This really is a fun game. Nice work! And I love the visuals. Nice, like Matt says, relaxing. Definitely should consider continuing this project post-Ludum. Love the visuals and mood definitely a really solid entry. This is such a promising game, but unfortunately it seems almost unbeatable to me. Things quickly go out of sync after a few nights, with mosters coming out of the woods in the morning instead in the night, the building menu only popping up way after noon, and the movement speeds seemingly changing as well. Also, since it doesnt seem to matter which buildings the monsters visually attack, i always lose at least 3/4 of all my buildings in the morning, with all of my food resetting as it seems impossible to collect more in a day than gets consumed by hunger. This leads to me always building new houses late in the evening when my few remaining citizens finally come out of the woods again, only to immediately be destroyed again, leaving me with even less houses for the next day and the day actually "starting" even later than last time. I think it would work nicely if the syncing issues were fixed and it would be a bit more predictable which houses get destroyed in the morning. I really like the visuals and the idea, but it does seem to lack the polish. Correct me if i am doing something fundamentally wrong here, but i really couldnt figure out how to make this work. @Lars Thanks for the feedback. I can reassure you that it is beatable! It's just a bit tricky. A lot of how the game goes depends on how you start. The general strategy is: make a couple houses very close to the forest, and a lodge far away from it. For the first day, build houses next to the first two as soon as you have the resources for them, but try to keep in mind the hunger value. The second day you might want to build another lodge, and keep building houses. By the end of the second or during the third, start building villas while keeping your house level constant. Maybe build another lodge or two if the wood is too low. Once you get over the initial night with 3 or so houses left intact, you should be good to go. Eventually you have enough resources for guard towers and then it's just a case of building a perimeter. I haven't noticed any sync issues on my end, but the monsters do come at the end of the night and leave just after dawn. If I had a bit more time, I'd probably adjust the timing of the monsters, since having them appear and disappear with the night is more intuitive! Houses disappear when all of their occupants are dead (you can mouse over a building to see its occupants), and this includes dying from hunger at the start of the next day. The houses nearest the forest are the ones that get chosen. Thanks again for your feedback. Let me know if you're still having trouble! I tried it again now and had no problems beating it. I just didnt really understand the Hunger mechanic right the first time. I always spammed as many houses as i could, leaving me with almost 0 Food at the end of the day, resulting in most of my village starving, obviously making it harder each day. I did not realize houses would disappear because of food-shortage, i just assumed the hunger would consume as much food as there is and thats it. With your tips and strategy it went much better. Its a thing i often notice with LD-games, though. I experienced it myself last time as well. You think your game has just the right difficulty or even is very easy because you, as the developer, have no problems beating it, but in reality people will often struggle with the difficulty set by the dev. As for the syncing-issues: I still do think they happen. At least the monsters spawn in the middle at the night at the beginning, and then a bit later every time. Because i was building all of my houses very far away from the forest the first time, that was very noticeable as they didnt even get to reach my houses before disappearing. Following your strategy one hardly notices anymore though. Anyway, upped my ratings since it was mostly because of me being bad, and not the game being as buggy as i first thought. Really love the concept and visuals. Cheers. I'm glad it clicked for you! I'll stick a bit of info about the hunger mechanic into the description, since that's something I completely forgot to explain anywhere! I totally agree about the balancing. It's hard to tell whether it's balanced when you're really good at the game. It's very easy to make it too difficult! Thanks for your comments, this sort of feedback is very useful. rally beautiful game, with suitable ambient countryside sounds. Very nice, I got destroyed by monsters but I'm going to give it another go when I'm not falling asleep on my keyboard. A very respectable loss, I say. For the greater good! Wow, this is awesome! I really like the low-poly art style. I love it! The graphics are simple, yet beautiful. The game is fun to play. Great job! Great mood, beautiful graphics (watch out molyneux) and I love building games. Very nice visuals. Love the font! It took me a while to figure out how to play, partly because the Unity webplayer didn't seem to want to take the input focus for some reason (pretty sure that's not a problem with my browser though, not your game). Once I figured it out it was relaxing and fun, if a little slow moving. I won! It's nice to play a short game that gives you a sense of accomplishment - well done. What else are you working on? @elefantopia - I'm glad you had a good time with it. I'm working on Cloudface right now (http://www.cloudfacegame.com) in a small team and a little puzzle game on my own! @philip_sinclair - Haha, the ambient bird noises is from outside my window. I forgot I was recording, so when I processed the audio I had to go through and remove all the keyboard clacking and exasperated cries. This is a really great looking game. I couldn't figure it out, though. I managed to place a few houses, but all but one got destroyed every night. I didn't manage to get villa to generate gold and so never got to build a guard house. Admittedly, the gameplay isn't really my style, but I love the art. Amazing how pretty it is considering the time constraints, and the audio definitely helps with the overall tone! The art is amazing and the concept is nice. It is just hard at first to understand how you play. Great artwork, great music... very relaxing. @Tifu - Hmm, I moved some stuff around in the folder on Google Drive and it might have screwed something up. It should be fixed now, though! It took me 17 days and 148 where killed, but I made it to the end :) This is probably the best entry I have seen so far! The art style is so lovely and the game idea is great! I was hooked! Great artwork! This game is awesome! It's relaxing, and yet exciting each night :P - This is undoubtedly among the best games I've played this dare! Very good job! Wow really well done, very nice graphics and sounds! the gameplay was unique and fun too! Also one of the few games with some mood that I've played! I found it a little too slow paced but besides thatit was a very relaxing and enjoyable experience. Really ambitious game (and executed pretty well too!). Graphics are nice, just wish there was more in game (the walkthrough you posted basically beat the game for me)indications of what everything does. Lovely visual style, together with the font it's extremely charming. I don't see a real connection to the theme though...did I miss anything? Gameplay feels a bit mundane and there's nothing which really feels fresh or new to me. Overall I'd say this is mostly about the looks, gameplay is just too shallow for my taste. @Maschinen - The link with the theme is sort of explained in the description at the top of the page. The forest is an endless source of food, but beneath the surface it's a murderous man-eating entity. There's also a link in the gameplay, in that you're building a town and at the same time sacrificing the poorer villagers to the forest to save everybody else. @spotco - The walkthrough is there just in case you're stuck with the game. A lot of people found it hard to get past the first few nights! Interesting entry. Quite hard to beat, had a good village going using the strategy you mentioned. Things had to be a little more detailed, though, since I couldn't see how much the buildings cost to build. But the visuals and mood are really great. Love this sorts of games, A+ on execution. I really liked this game but at one point all of a sudden all my houses did the dying animation but when I moused over where they had been it still showed how many occupants were in it and when the sun rose people popped out out of no where. Hi. Seemed a bit slow overnight. Sun was going in unexpected direction - probably a cultural thing. Love the visuals, material crinkly paper look and the gentleness of it - including gentle monster murder... A more involved/developed version would be interesting to see. @Diptoman - there's a tooltip at the bottom left of the screen, but I have a feeling it's getting cut off for people who have shorter screens. @dkkarate - that's weird. The houses disappearing was probably due to starvation (the hunger value was higher than the food value) but people shouldn't have been appearing. Thanks for the heads up! @mjrevel - the guard doesn't come out of the guard tower! He shoots from the windows. I probably should have made that clearer, as every other building spawns a visible villager. I quite like the game, but I had 3 straight nights of no deaths and nothing happened. Is there a "you win" screen at all? Cool, game worked now. Once I had a better idea of what I was doing it was pretty fun. I like the art style, feels like its all made out of paper. @joe40001 - the win condition triggers at the start of the next day. It _should_ be 3 nights, but I might have accidentally made it 4! There is a win screen. Awesome game. I love the idea of not expanding too quickly, making sure you have enough food before building more. Pretty cool. 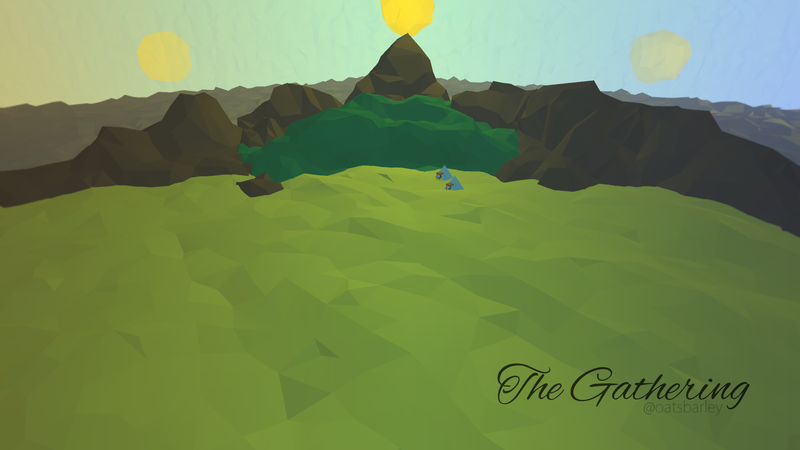 I like the simple polygon graphics and the general mood. It's kind of soothing in a way. Simple but fun strategic mechanics. Like it! One of my favorite game. Cool visual, easy to play... Cool game!! I like it, I could totally get into a game like this; where is the theme though? I like the low-poly graphic style and enjoyed the simple but addictive gameplay a lot! Well done! One of the best entries tried so far! Finished the game in 10 days (on about 5th try) and 88 of people died. Good job! Everything about the game is great, except it lacks replayability. Once you figure out the winning strategy, it's kinda pointless to play again. Then again, figuring out the winning strategy took longer than most LD games keep you entertained. Nice game, really complete and deep. Dont see the relation with the theme though but a great game anyway! 11 days have past, and 68 villagers have perished. I don't think I did too bad, especially considering my 2nd villa was built just to the right of the center of the forest (misclick) and somehow managed never to fall (although it did drop to 1 occupant a couple times). The biggest problem I had was waiting for tents near the mouth of the forest to get completely removed to make room for turrets, since I failed to leave spaces for turrets when I initially started building. @VDZ - that's a good point. Admittedly replayability wasn't really high on my list when I was making the game, since I didn't expect anyone to play it more than once when they were voting. If I do something more with it I'll definitely look into that, though! @SnoringFrog - there must be a collisions bug if it let you put a building in the forest, whoops! And I think some sort of building removal would be a good idea, to help out in situations like you described with the tents and the guard towers. Good game, poor people when I in charge ;) Nice polished game considering time limit. Despite a few comments here, I'd rate this game well on the side of easy, which is "relaxing" vs a frenetic miss a move and you're dead kind of thing. I created a "minigame" to push the game to its limits. I've gotten a couple of wins on the 600+ man range. With a little work I think someone can hit 700+. But around there feels like the limit - just running out of room in all categories because the villagers can't serve the last couple of rows of houses. But the engine still sorta worked with 600 items, so that's impressive for a Ludum Dare. That "sacrificing" idea is vicious and bears a bit of thought. Remember, the "you win" clock doesn't start if you're losing people! So you can keep building and then you put a couple of cannon fodder tents way at the front. It's Occupy Wall Street except you are the 1%! Enjoyed the graphics especially the sunrise and sunset. The little monsters are cute. I felt like there should have been a cursor to mark build spots but it's a minor detail. I love the build and defend mechanic. I felt a little bad sacrificing the villagers with the small houses early on, but it was fun to build more fancy stuff later. Hope you do more with this. Pretty decent little city builder! The monsters from the forest are a nice addition. It was fun at first, but then, I got a bit bored.. Loved the graphics and the city builder kind of thing. I love the geometric graphics! And the ambient sounds are perfect! Thanks for your comments, everyone. They mean a lot, and I'm definitely taking on board your suggestions/criticisms! amazing graphics, and relaxing yet addicting gameplay. Would love to play this on a tablet while on a long ride, great job!